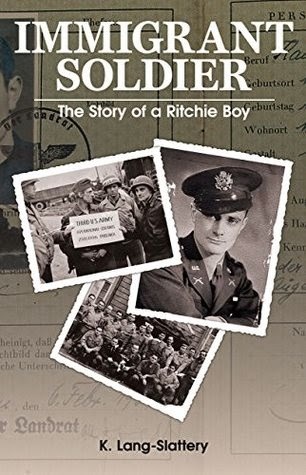 Immigrant Soldier, The Story of a Ritchie Boy, based on the true experiences of a refugee from Nazi Germany, combines a coming of age story with an immigrant tale and a World War II adventure. On a cold November morning in 1938, Herman watches in horror as his cousin is arrested. As a Jew, he realizes it is past time to flee Germany, a decision that catapults him from one adventure to another, his life changed forever by the gathering storm of world events. Gradually, Herman evolves from a frustrated teenager, looking for a place to belong, into a confident U.S. Army Intelligence officer who struggles with hate and forgiveness. 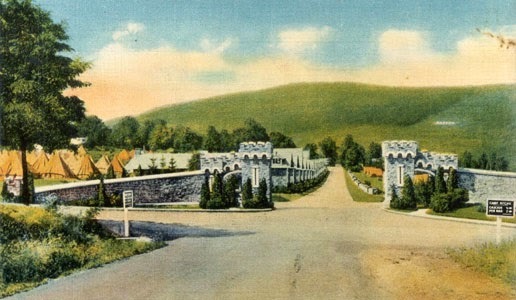 Postcard featuring the entrance of Camp Ritchie, Md. K. Lang-Slattery Immigrant Soldier was a huge gear shift for me. I read war era fiction all the time, but picking it up on the heels of Paul Letters' A Chance Kill emphasized a lot about Lang-Slattery 's writing. Emotion propels the narrative beginning to end. The story trades on a lot of internal conflict and private feeling and I think that went a long way in developing Herman's character. Lang-Slattery 's approach made her hero easy to identify with and drew readers into the world as he saw and experienced it. Historically, I think Immigrant Soldier has a lot of really great material, particularly regarding the Ritchie Boys and US special military intelligence, but I couldn't help feeling the author might have done more in terms of atmosphere. I liked Lang-Slattery's presentation of fact, but I often had difficulty envisioning Herman's surroundings. Like Cara Langston's Battle Hymns and Trini Amador's Gracianna, Immigrant Soldier captures the individual experience of the WWII. Earnest, informative and heartfelt, the book evokes the spirit of a unit who refused to be victimized and honors their contribution to the war effort. “You have arrived at Camp Ritchie, the United States Military Intelligence Training Center. Some of you are United States citizens, either by birth or naturalization. But many of you are not. Don’t worry. Your loyalty is understood or you wouldn’t be here."